Growing up, I wasn’t the biggest fan of cranberries. Every now and then I ate that jiggly dessert we Americans call cranberry sauce, but it wasn’t until my cousin Kathryn introduced me to real cranberries that I fell in love. Thanks, Kath! I’ve been on a bit of a shrub kick lately. You are probably asking yourself, what the heck a shrub is? 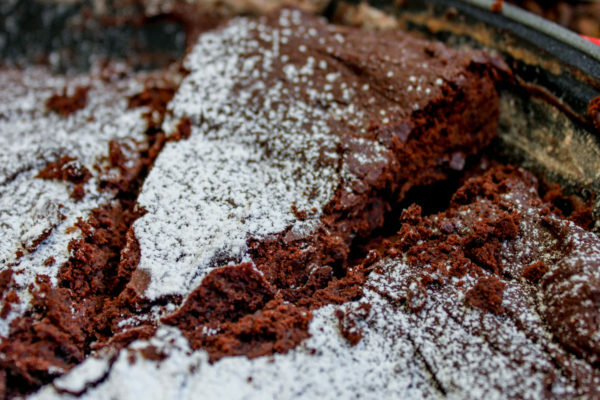 Well, in food world, shrubs are an acidulated beverage made of juice, sugar, vinegar, and other ingredients, such as soda water or even booze. These drinking vinegars were popular during Colonial America as a way to capture the freshness of seasonal fruits. Despite their popularity, home-refrigeration forced these drinks into obscurity. 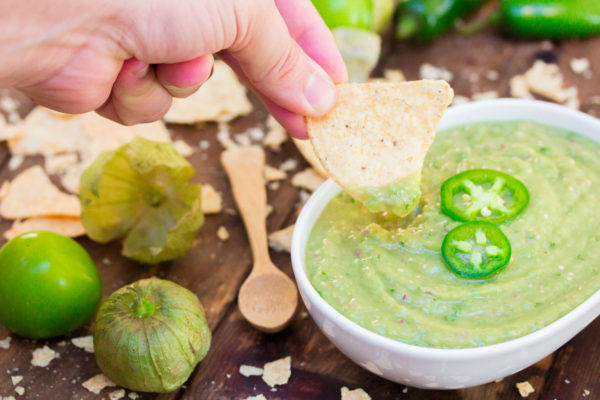 Much like the fashion world, the food world also dips into the past for inspiration and shrubs have been making a comeback. While there’s now way I could pull off skinny jeans… I am quite in love with shrubs. 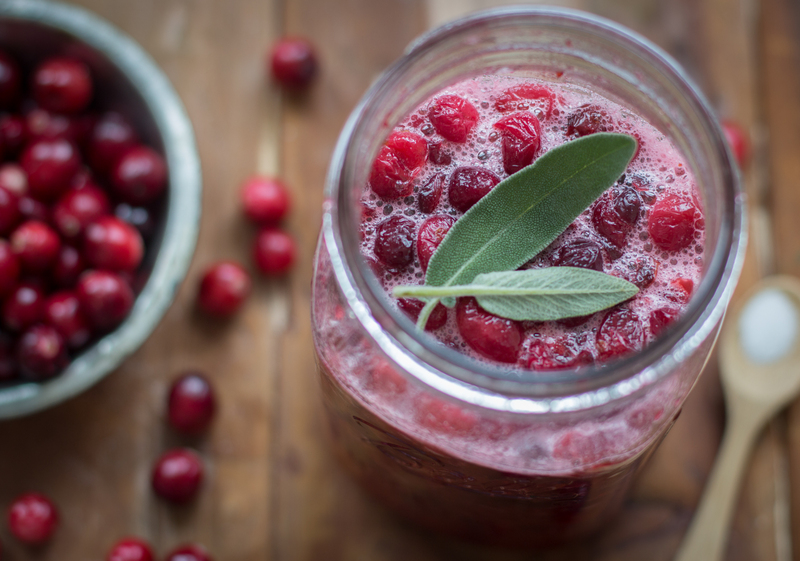 And this Cranberry & Sage Shrub will be served at Thanksgiving! And Christmas… possibly July. I typically make my shrubs using a cold process. That is where you cover chopped up fruit with sugar and let it sit. But cranberries need a little help in this department. 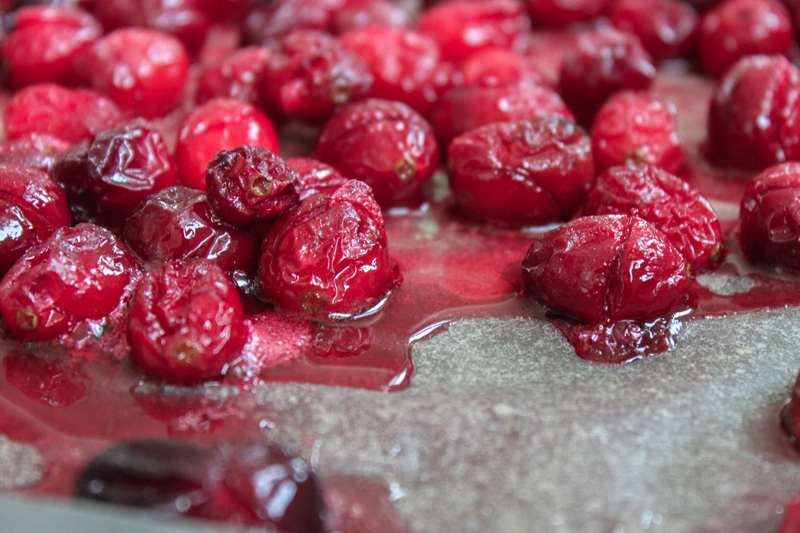 Place the cranberries on a parchment-lined baking sheet and bake them for about 20 minutes at 350 degrees F, until they look something like this. If you listen carefully you can hear them popping in the oven. 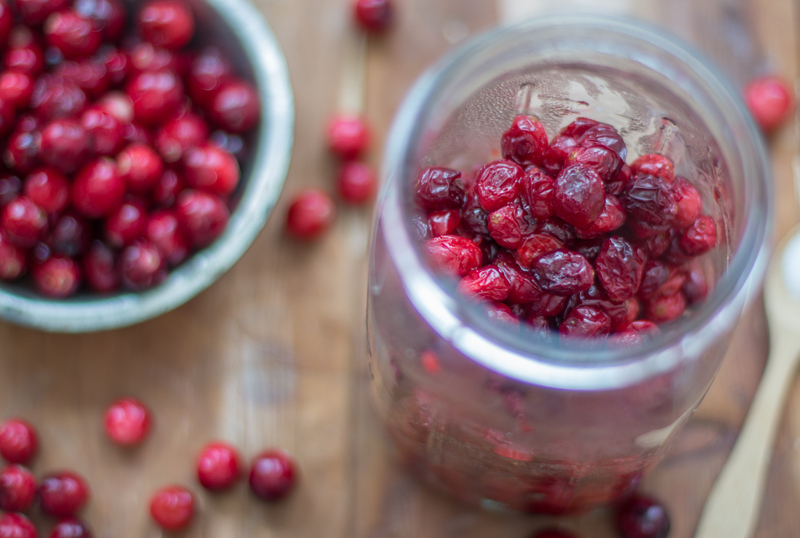 Transfer the roasted cranberries to a quart-sized mason jar. Add the 1 cup of sugar and cover and seal the mason jar. 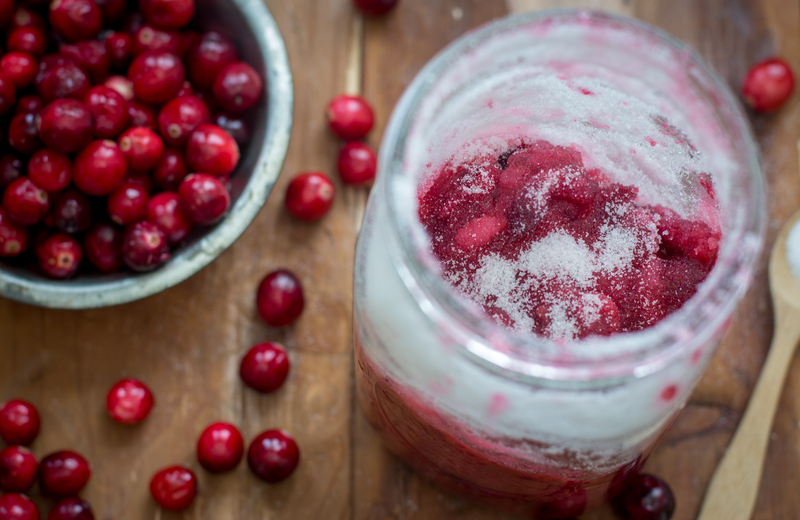 Shake the hell out of it so that all of the cranberries are covered with sugar. Let stand in a dark cool place for 5 hours; the sugar and cranberries will form a syrup. Add 1 cup of vinegar to the cranberries. I used apple cider vinegar but you can also try others, such as champagne or red wine. Cover and shake the mixture, trying to dissolve as much of the remaining sugar as possible. Add in the fresh sage leaves and stir, so they are soaking in the vinegar. Let the cranberry mixture stand for 24 hours in a dark cool place, shaking regularly. Shrubs can be served in a variety ways. You can drink them straight or even use them in cocktails, like I did in my new cookbook, Holidazed. I served this shrub with some club soda. 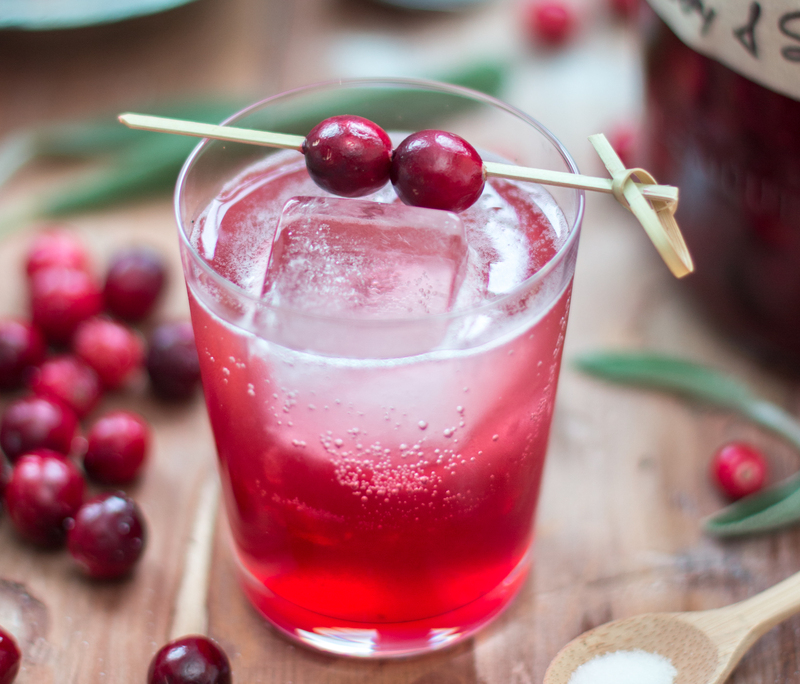 Using a single old fashioned glass filled with ice cubes, add 2 ounces of cranberry and sage shrub syrup and top off with club soda. 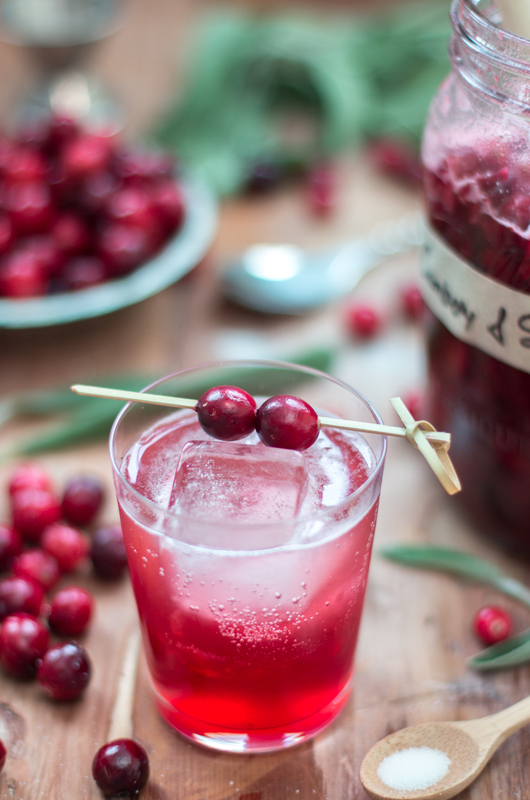 Garnish with fresh cranberries.